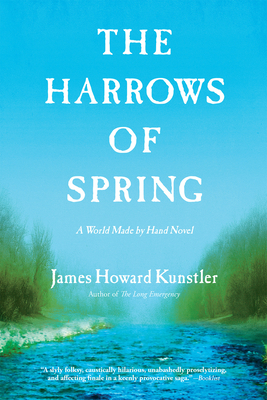 From the renowned social critic, energy expert, and bestselling author James Howard Kunstler, The Harrows of Spring concludes the quartet of his extraordinary World Made By Hand novels, set in an American future of economic and political collapse, where electricity, automobiles, and the familiar social structures of the "old times" are a misty memory. In the little upstate New York town of Union Grove, springtime is a most difficult season, known as "the six weeks want," when fresh food is scarce and winter stores have dwindled. Young Daniel Earle returns from his haunting travels around what is left of the United States intent on resurrecting the town newspaper. He is also recruited by the town trustees to help revive the Hudson River trade route shut down peevishly by the local grandee, planter Stephen Bullock. Meanwhile, a menacing gang of Social Justice Warriors styling themselves as agents of the Berkshire People's Republic appear one evening camped on the outskirts of town. Their leaders are the imposing Amazonian beauty Flame Aurora Greengrass and the charismatic grifter Sylvester "Buddy" Goodfriend, progressive to a fault in their politics and determined to extract whatever tribute they can from the people of Union Grove. Romance, politics, bunko, violence, and family tragedy swirl through the thrilling finale to Kunstler's bestselling series. The Harrows of Spring is a powerful, heart-wrenching, and satisfying conclusion to this poignant history of the future. James Howard Kunstler is the author of thirteen novels, including World Made by Hand, The Witch of Hebron, A History of the Future, and five nonfiction books, including The Long Emergency, Too Much Magic, and The Geography of Nowhere. He has participated in TED conferences and lectured at Harvard, Yale, Columbia, Cornell, MIT, and many other colleges, and regularly appears before professional organizations across the country. He lives in upstate New York.